Case 15: A 12-year-old overweight male presents with four weeks of an intermittent left leg limp. He denies an injury but remembers landing from catching a ball and having some pain. He points to the groin and thigh area and says he has pain with prolonged running and walking but no pain at rest or at night. He walks with a slight limp and has pain and mild limitation with internal rotation and abduction of the hip. Source: Adapted from Ref. 13. Figure 12 Avulsion injury of the anterior superior iliac spine. walk with a limp with the affected leg in an externally rotated position. They may have limited internal rotation or abduction and have pain with hip movement. Some will have obligatory external rotation of the hip with flexion of the knee. 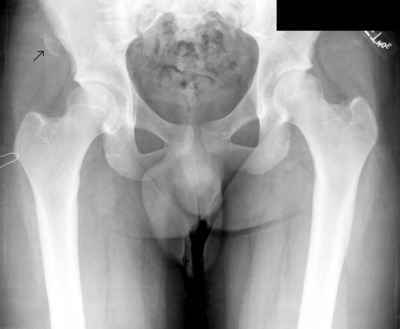 AP and frog view of the hips show slippage of the epiphysis (Fig. 13). SCFEs need immediate surgical management to prevent further slippage and damage of the hip joint. Adolescents should be made non-weightbearing on crutches and sent for immediate orthopedic evaluation.